"Our philosophy is simple: Promote a latte-colored world!" When high school senior Asha Jamison gets called a "towel-head" at a pool party, the racist insult gives Asha and her best friend Carey a great money-making idea for a post-graduation trip. They'll sell T-shirts promoting the Latte Rebellion to raise awareness about mixed-race students. Seemingly overnight, their "cause" goes viral and the T-shirts become a nationwide fad. But as their cimple marketing plan takes on a life of its own, Asha's once-stellar grades begin to slip, threatening her Ivy League dreams, while her friendship with Carey hangs by a thread. And when the peaceful underground movement turns militant, Asha's school launches a disciplinary hearing. Facing expulsion, Asha must decide: how much is she willing to risk for something she truly believes in? 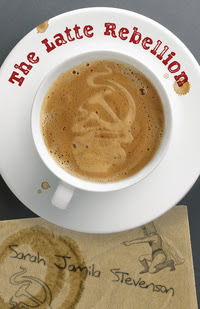 The Latte Rebellion opens with the main character, Asha, dozing off while sunbathing at the Inter-Club Council party. From the sound of things, it’s been a decent, if not fantastic, day. Then Roger Yee has to go run off his mouth and call her a towel head. This event spurs Asha and her best friend, Carey, to begin the Latte Rebellion. What starts out as a money-making scheme to fund their summer vacation plans turns into a nationwide fad. The time and effort Asha puts into the Rebellion causes her grades to slip, and as the Rebellion is drawn farther and farther into the limelight, Carey begins to pull away. Told in flashback interspersed with glimpses into her school’s disciplinary hearing regarding Asha’s possible expulsion, The Latte Rebellion is an eye-opening glimpse into today’s unfortunately realistic attitude toward multi-racial – or “latte-colored” – people. Though not multi-racial, I am an adopted mutt of both Eastern and Western European descent, so I can definitely relate to the main character. This was certainly an interesting read, and I would recommend it to those who are interested in viewing the world through a different cultural lens. I could see The Latte Rebellion being an interesting pick for a school book club, as the discussion would be very thought-provoking.